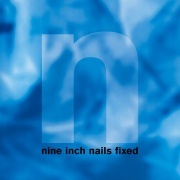 Fixed (also known as Halo 6) is an EP by Nine Inch Nails released on December 7, 1992. Fixed is the companion remix disc to Broken. Guest remixers include Butch Vig, J. G. Thirlwell, Peter Christopherson of Coil, and live band member Chris Vrenna. The official release had one contribution by Butch Vig, which was the end portion of "Throw This Away". Vig had originally remixed the song "Last", but it was cut from the final version of the EP. Trent said that Vig basically did what he always does with any song: he made it rock. However, Vig has stated in interviews that his remix of "Last" was not included simply because "Trent didn't like it." Therefore only part of Vig's mix appears at the end of "Throw This Away." The original mix appeared on the internet as an 8-bit mono 11khz file in 1993. In 2007, a high quality version was uploaded by Reznor on remix.nin.com. This remix EP employs some rather unorthodox mixing techniques to give the listener an intentional sense of confusion on initial (and sometimes subsequent) listenings. On the opening "Gave Up" remix, the song picks up with a frantic rhythmic jumbling of Trent's vocals directly referencing the lyrics ("smashed myself to pieces"). This would seem to involve chopping up each syllable of the chorus vocals running forward and reverse (normally as PCM files) and use a sampler to re-sequence them together in manic fashion. Like many avant garde industrial music acts before, this release helped pioneer the notion of the remix as an artform, far removed from just commercial "milking" of an existing product. Remix artist John Balance (of Coil) expressed his dislike of choruses in the song and decided to take it in another direction. Outtakes from Coil's "Gave Up" remix sessions were obtained by fans in 2012 and released on the unofficial download-only compilation Uncoiled, and one mix was later released semi-officially on Recoiled. The re-release of The Downward Spiral (along with Trent's own words, shown below) started rumors that Broken/Fixed could eventually be re-released in high definition stereo and surround sound. Previous release - "Broken" Halo number: 6 Next release - "March Of The Pigs"
This page was last modified on 29 June 2018, at 22:54. This page has been accessed 174,993 times.